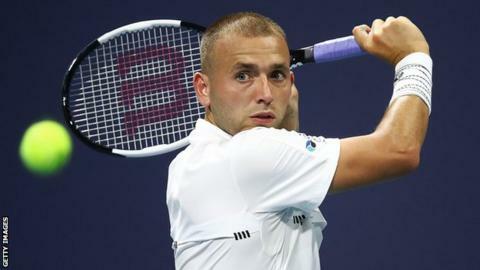 British number three Dan Evans was knocked out of the Miami Open in the second round as Denis Shapovalov recovered from going a set down to win. Evans, the world number 97, took the opening set 6-4 before the 20th-seeded Canadian stormed the second 6-1. The 19-year-old then saved two break points as he closed out the third 6-3 to win in two hours one minute. Roger Federer came from a set down to beat world number 46 Radu Albot 4-6 7-5 6-3 to reach the third round. After winning Saturday's first set, the 29-year-old Moldovan had to serve to stay in the second when he trailed 5-4. But world number five Federer broke Albot in the 11th game to take the set 7-5 and force a decider. Both Federer, 37, and Albot held their serves in the third set until the Swiss made the only break to serve for the match at 5-3, and sealed victory on his first match point. After defeating Briton Evans, Shapovalov will now meet Andrey Rublev of Russia, who beat Croatian ninth seed Marin Cilic 6-4 6-4. Evans, 28, had only reached the main draw as a 'lucky loser' before beating Tunisia's Malek Jaziri to reach the second round. Meanwhile, Swiss Stan Wawrinka suffered a surprise 7-5 2-6 7-6 (7) loss to 103rd-ranked Serb Filip Krajinovic, while Belgian world number 20 David Goffin beat Pablo Andujar of Spain 6-4 6-1. Bulgarian Grigor Dimitrov knocked out Spaniard Feliciano Lopez 6-1 6-3, and Leonardo Mayer beat fellow Argentine Guido Pella. Portugal's Joao Sousa progressed against American Steve Johnson, while Spaniard David Ferrer rallied to beat world number three Alexander Zverev of Germany 2-6 7-5 6-3. Ferrer, 36 and ranked 155th in the world, received a wildcard for the tournament and is competing in his final year as a professional player.